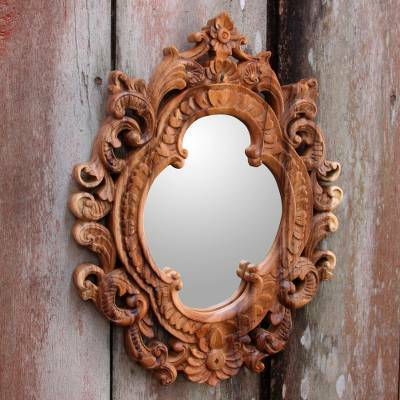 Ornate Rococo Style Carved Wood Mirror from Bali Artisan, "Mataram Rococo"
Mataram, now the name of a city on the Indonesian island of Lombok, was once the name of both an Islamic sultanate and a Hindu-Buddhist kingdom in Java. The talented Sarwaedi in Bali names this hand-carved wood mirror after the diverse and historically rich region. The mirror, which has a beautifully rococo style, is crafted from richly grained suar wood with a natural finish. This wonderful mirror exceeded my expectations. I ordered many items over the last couple of years from Novica and never have been disappointed.Highly recommended.